Last week’s jobs report was solid. A total 287,000 jobs were added in June, bringing the quarterly average to 147,000 per month. The June number follows a very weak May reading, however. There is considerable volatility in the month-to-month data, so it is important not to become overly fixated on one month. Comparing the second quarter average job gain of 147,000 to last year’s second quarter job gain of 205,000 paints a weaker picture. Overall, we see an economy that is still expanding but, as a result of slower global growth, has downshifted into a slower gear. Our hypothesis, that we are on a slow-but-positive growth trajectory, will be put to the test again this week with the release of industrial production and retail sales. As the chart below shows, both industrial production and capacity utilization slid through 2015 as China and other foreign economies downshifted throughout 2015. While other data has shown some sign of improvement in global trends, the recent Brexit concerns and related rise in stress among some European banks is likely to weigh on momentum, at least temporarily. For the slide in global and domestic growth to be arrested, we need to see evidence of a turn in industrial output and further positive readings from the consumer. According to a Bloomberg survey, June industrial production is expected to have risen 0.2% versus last month’s -0.4% decline when data is released Friday. On the consumer front, we will see steady progress. 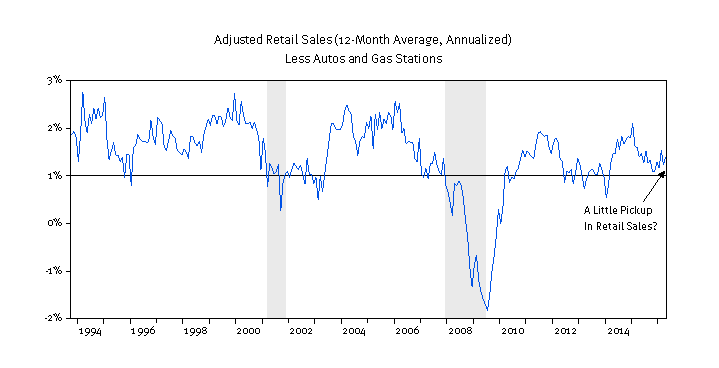 Retail sales, excluding automobiles and gasoline, are holding relatively steady between 1-2% growth (chart below). Steady consumer demand is helping to bring inventory levels in line with sales. As inventories are gradually drawn down, the drag from an inventory “overhang” tends to fade, and growth improves. Thus a steady retail performance is critical to any expectation for a rebound in economic output in the second half of this year. Friday’s June retail sales report is expected to deliver steady 0.3% growth in sales, in line with last month’s reading. While this rate seems a little optimistic to us given employment and wage trends, continued positive readings are consistent with continued GDP growth near 2%. Apart from industrial production and retail sales, we continue to monitor several other trends with interest. Corporate profits and investment are at the top of this short-list. 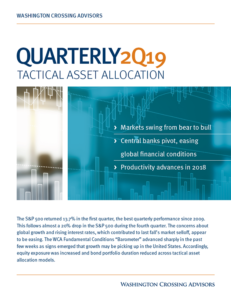 We note that S&P 500 index corporate profits are expected to be down -5.6% year-over-year through the second quarter, according to FactSet. This would mark five quarters of declines and the longest losing streak since the recession. Investment trends are also weak, mirroring profits. A slowing in durable goods orders over the past year is not a good trend in this regard. 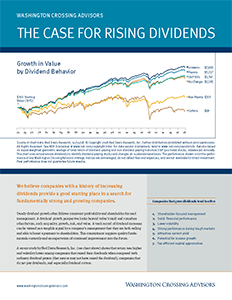 Should declining profits and investment be joined with a third impulse from rising risk aversion, the chances of a longer and more severe global downturn increase materially. A plunge in global bond yields into negative territory underscores these risks. For our growth forecast to be met this year, it is important that the pickup seen in the data through the spring continue as we move through the summer months. This week’s data on industrial production and retail sales provide us with a couple additional, but important, data points to test the second-half “pickup” hypothesis.